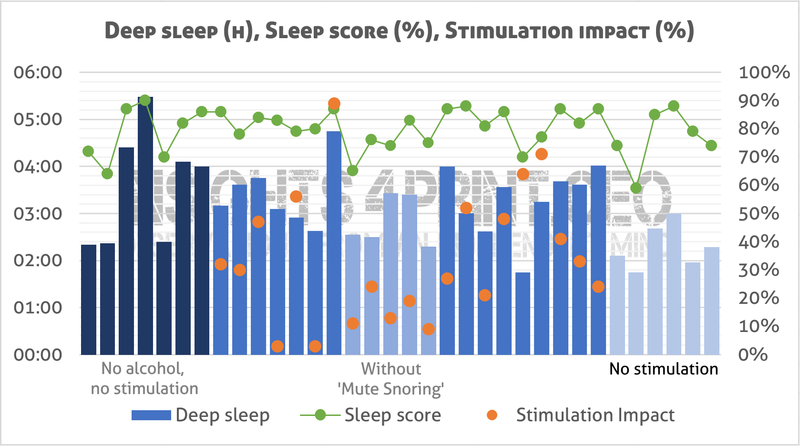 At first sight, it might look off topic for a business-oriented blog: testing a sleep analysis and sleep improvement device. But consider this: one out of three or four has sleeping problems. Which results in fatigue, concentration problems, errors. And that’s bad for business. And that’s the reason why every manager should care about the sleep of his workforce. And this new sleep analysis and sleep improvement headband – Dreem – might just be what you need. Yes, why should you bother about the sleep quality of your workforce? 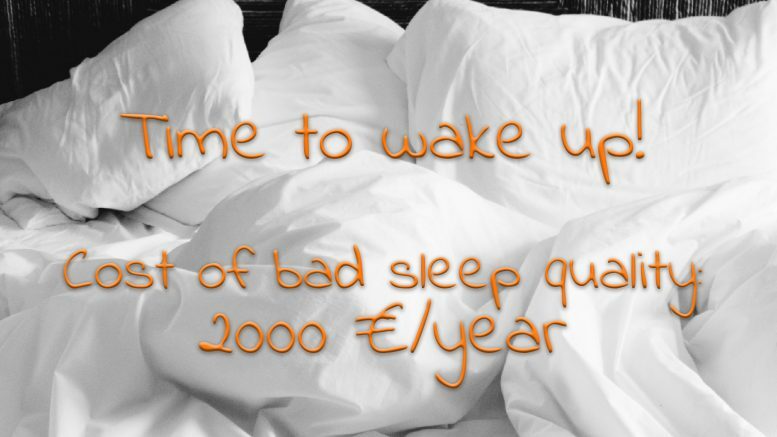 Because lack of sufficient sleep quality costs you money, lots of money. A study in the Netherlands (17 million inhabitants) revealed that bad sleep quality costs society some 3 to 4,5 billion euro. And that’s not taking into account the errors made while working: imagine that your press operator had a bad night and made a stupid mistake due to lack of concentration, which resulted in a rejected job and a reprint. Or that a prepress operator selected the wrong preflight or workflow profile, also resulting in a rejected job and a reprint. Fatigue is also the number one cause of accidents on the work floor and this can be linked to sleeping problems. The figures from the Netherlands show that sleeping issues lead to 8 extra days of sick leave per employee, per year. Which translates into a cost of 2000 euro, a figure a business manager can’t neglect. The effects of bad sleep shouldn’t be underestimated. It’s much more than just being tired. It can lead to concentration problems, memory gaps and other issues. And I know: I’ve been there. In case you aren’t aware of it: I’ve been fighting an ever-increasing fatigue issue for four years, which eventually forced me to stop working. After a long search, and a fortunate accident, a link was discovered between my breathing and my sleep quality. A small surgery, combined with a better breathing technique, fixed the issue, a few months later I was sufficiently recovered to end the sick leave. You can read the complete story here. From this experience I know that sleep quality is extremely important: despite sleeping between 10 and 12 hours per night at the height of my fatigue issue, I still was exhausted. I had a lot of sleep, but the quality was limited. Especially the amount of deep sleep is important: this is the part of your sleep when your body physically recovers and repairs, when it evacuates toxins. And that was my main issue: my muscle tissue didn’t regenerate anymore, partially due to an insufficient amount of deep sleep. Recent research even found a link between dementia, Alzheimer’s disease and the amount of deep sleep. Measuring sleep quality is something complex. In a sleep lab, they put all kinds of sensors on your head, chest, fingers and legs to get a good analysis. Next to audio (snoring) and video recordings (movements). But that’s not feasible in everyday life. All kinds of activity trackers and smartwatches claim to analyze your sleep, but the quality is often questionable. The most basic analysis is based on your movements (very inaccurate), some also include heart rate, but that’s not enough to get a good analysis. I have used a Microsoft Band 2 for a long time and this one also includes skin temperature. At one time, during the long search to find the cause of my fatigue issue, I had the opportunity to use it alongside a medical grade device and the doctor confirmed that the results of both were consistent and that I could trust the sleep analysis of the Band 2. But this is not the case for every smartwatch or activity tracker: during the last weeks that my Band 2 worked (there were hardware issues: battery problems and the band broke), I compared it with a Fitbit Charge 2: the results were very different. I returned the Fitbit and went for a Garmin Vivosmart 3, but I always had the impression that it wasn’t that accurate on sleep quality either (for tracking heart rate, steps it seems more accurate to me). 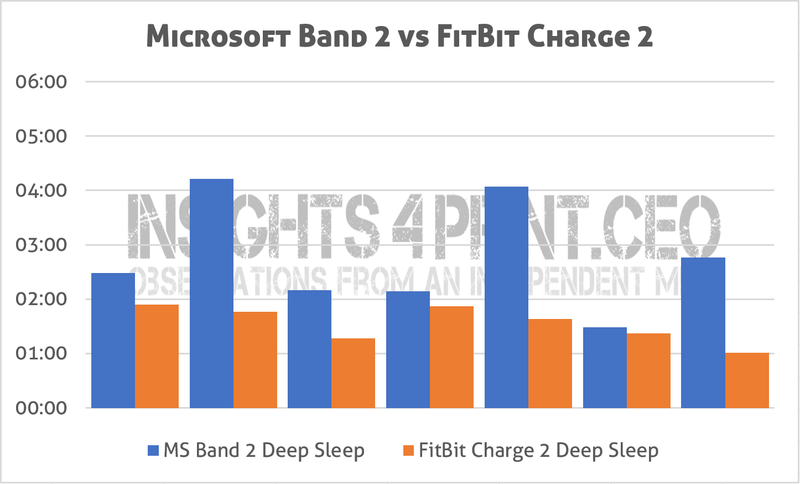 This graph shows a comparison of the amount of deep sleep registered by the Microsoft Band 2 versus the FitBit Charge 2. A month ago, I received a new device: a headband with an EEG sensor and a pulse-oximeter, called Dreem. That EEG-sensor analyzes the brain activity and this is what really counts: what is your brain doing? E.g., during your deep sleep, your brain waves are slowing down. Here is an interesting article explaining the different sleep stages. I found it intriguing that I would be able to buy a device that makes use of the same techniques used in a sleep clinic and although it isn’t cheap, I jumped. Sleep quality will stay a point of attention for me for the rest of my life. 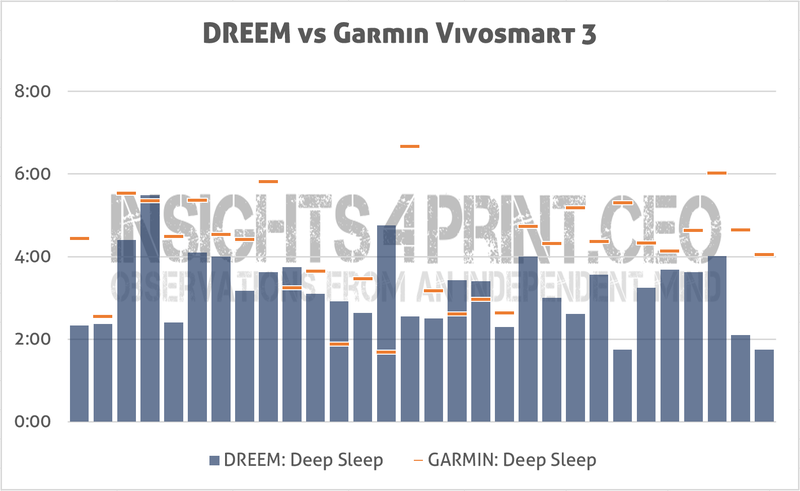 A comparison of the amount of deep sleep registered by the Dreem headband (EEG sensor) and the Garmin Vivosmart 3 (movement, hearth rate). Already after the first night with the Dreem headband, I was excited about the amount and the quality of the data that it shows. 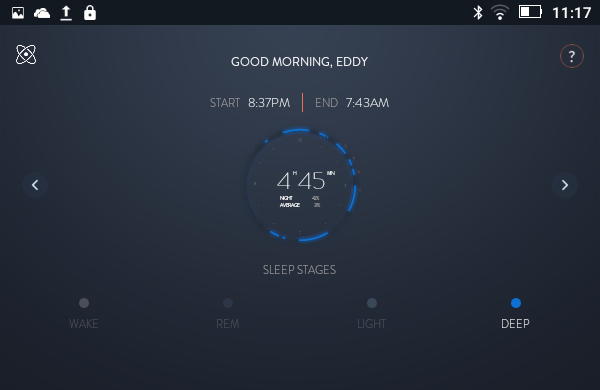 The headband doesn’t only provide information about the duration of the different sleeping phases, it also shows how many times you turned in your sleep, how many times you woke up. And it gives you a general score, for quick analysis. Not only does the Dreem headband give you an impressive insight into your night, it also offers tools to improve your night. The first one is a set of sounds and techniques to fall asleep faster. You can choose from some interesting background noises and meditation techniques, which looks interesting. But I have to admit that – until now – it didn’t have much effect… Maybe I have to try some of the techniques I haven’t used yet. But more important is ‘sleep boost’, which stimulates the deep sleep phase. While tracking the brain waves in real time, the headband can intervene at the moments when you are slowly shifting from deep sleep into another phase, trying to extend the deep sleep phase, by using ‘pink noise’. As said before: that phase is extremely important for your body to recover and repair. And I have to admit: this really works! Already from the first night, I had improvement rates of over 35%, one night almost 90%. And not only does this figure show up in my morning overview: I also feel it. I feel better rested than before. And now I wake up earlier, about half an hour before my ‘normal’ wake up time. To show you the level of sleep measurements, let me share you some information about my first month with the Dreem headband. During this month, I checked some variations: with/without deep sleep stimulation, with/without a ‘nasal dilator’ I use (Mute Snoring), with/without moderate alcohol use in the evening. The other test I wanted to do, is the use of my nasal dilator. I started using a nasal dilator the moment when it became clear there might be a link between my breathing and my sleep quality. I tested half a dozen of them and the only one that worked for me, is Mute Snoring. In case you don’t know what a nasal dilator is: it’s a small device that you enter into your nose and that will physically keep your nose open, preventing that it closes a bit during breathing. And the figures show: without the nasal dilator, I had about half an hour less deep sleep, the sleep score was 7 to 8% less. Conclusion: it works. For the record: I have recommended this dilator to some people I know with fatigue issues, two of them started using Mute Snoring and both saw a positive effect. And then there is the last test: moderate alcohol usage… I’m not a heavy drinker, but I like to have a (light) beer or a glass of wine after work, during dinner. Which translates into 2 or 3 units per evening. The first week that I used the Dreem headband, was the final week of ‘Tournée Minerale’, an initiative in Belgium to be alcohol-free for one month. That week I didn’t use the deep stimulation yet. And when looking at the amount of deep sleep: I had a lot more deep sleep than compared to the other week without deep sleep stimulation (3:35 vs 2:17) and slightly more deep sleep then the best week with alcohol and deep sleep stimulation (3:35 vs 3:25). So even moderate use of alcohol does impact your deep sleep… I still have to test the combination of no alcohol usage and deep sleep stimulation to see if the amount of deep sleep can be boosted to an even higher level. This is the overview with the weekly averages. Please not that in some cases I ended the ‘week’ earlier, because of the bad effect of the test on my sleep quality. And this shows the amount of deep sleep, the sleep score and sleep stimulation impact on a daily basis. Although I’m very satisfied, some improvements could be made. The two most important improvements for me are: the use of the pulse-oximeter to measure oxygen saturation and online statistics which could be shared with your doctor. The headband has a pulse-oximeter built into it, which also measures the oxygen level, as the name suggests. At this moment, that feature isn’t used. But it could be very useful, if accurate enough: this could detect apnea issues. And in case you don’t know yet: apnea is a serious sleeping issue, you literally stop breathing. I have severe apnea: without using a CPAP-device (‘high-pressure mask’), my breathing stops 80 times per hour. So every 45 seconds I suffocate a little bit. That’s a serious issue. That’s why I would love to see this measurement being activated in the Dreem headband. And the second improvement is more statistics. At this moment you already get a lot of information, but for people with a sleeping issue, it is important to be able to make long-term statistics. That is what I have done during my long search, using a big Excel worksheet, that’s how a certain trend was detected, which led to the link between my breathing and my fatigue and eventually to the cure. Being able to share this kind of information with your doctor would be a great thing. At this moment Dreem is positioning itself as a sleep enhancement device, but the company should not underestimate the market opportunity as a sleep analysis device. It would be a great tool for people with a fatigue issue, I’m convinced that in many cases fatigue issues are linked to bad sleep quality. 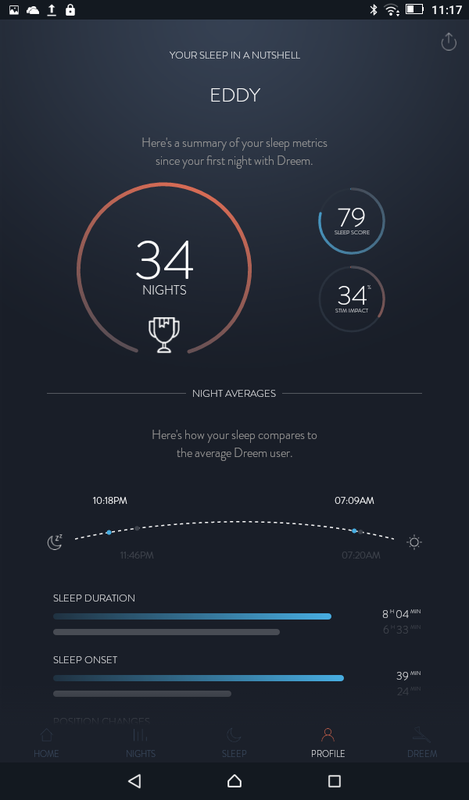 Thanks to this device you can finally get a consistent sleep analysis for a longer period. And this could even be a subscription service. You already guessed it: I’m very happy with this tool. It is also a rather unique tool, only one other company has announced something similar: Philips. But with one important difference: Dreem uses a dry EEG-sensor, while Philips uses a wet EEG-sensor where patches need to be replaced after some time. The investment in the Philips is a bit cheaper, but you will need to buy new patches on a regular basis. And this brings is to the cost… The Dreem now sells at 499 euro/dollars. That’s not cheap. But look at it from this – more business-oriented – perspective: let’s say you can write it off in 2 years (the warranty period in Europe), that’s less than 1 euro/dollar per night. Isn’t that a fair price for a good night’s rest? And don’t forget: I have gained half an hour per day thanks to the sleep stimulation. Plus: they have a 30 days money back guarantee if you are not satisfied, so the risk of trying is very limited. While 499 euro/dollar might be a significant investment for an individual, it’s not that big of an investment for a company. And this is something you might consider: buy a few Dreem headbands and make them available to your workforce. Let persons with a fatigue issue try it for a month, to get a good sleep analysis, to try the deep sleep stimulation. 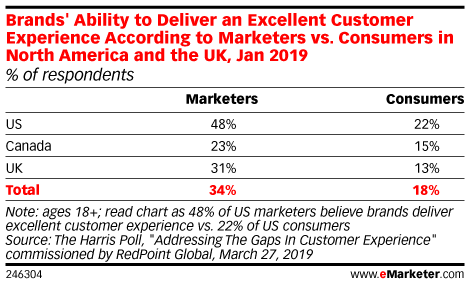 I’m convinced you will see a (very) positive ROI! There is just one thing you have to be cautious about: privacy issues. So you should probably get the company health department involved to check the sleep analysis, not you as a manager. Sleep quality is extremely important, both for your personal life quality as for your work. Too many people suffer from sleep issues. With the launch of the Dreem headband, we now finally have a high quality sleep analysis device, that is available for everybody. And as shown in my tests: the sleep improvement technique works. The deep sleep stimulation improves sleep quality, and therefor it improves life quality. In my case, it has even added half an hour to my day. PS: in case it wasn’t clear yet: I’m keeping the Dreem headband! It’s such an improvement for my sleep quality, for my quality of life. It’s worth the investment. Update 31/03/2018: it seems I hadn’t turned on the sleep stimulation last night… So, fortunate for you, I now have another day to add to the ‘no stimulation’ statistics, making it a full week. And the average amount of deep sleep is now 2:09 instead of 2:16, the sleep score is now 76% versus 77%. Which makes the effect of the stimulation even larger. Update 27/06/2018: if you want to know more about the importance of sleep and how you can improve it, here is a good article. Update 10/09/2019: here is an interesting article on how much time one needs to sleep. Be the first to comment on "Sleep quality matters: time to wake up (with Dreem)"